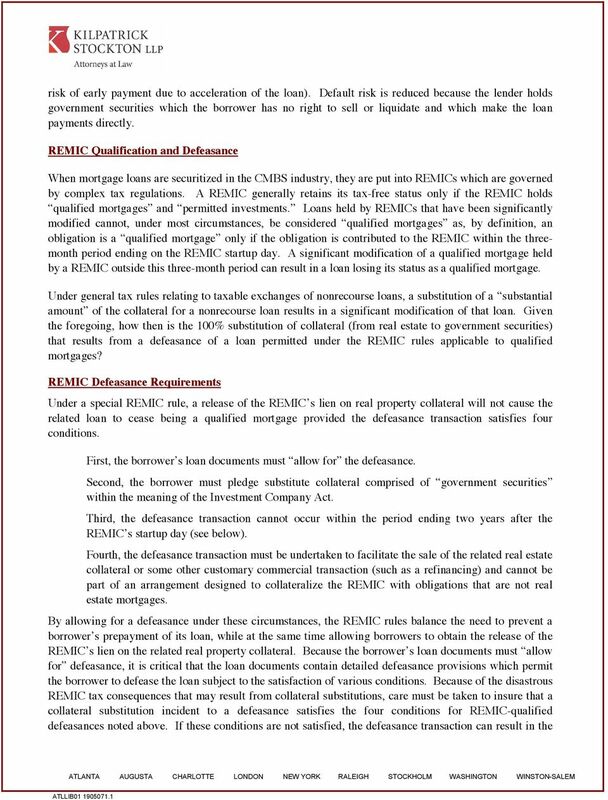 Download "DEFEASANCE A PRACTICAL GUIDE"
3 REMIC holding a loan that is no longer a qualified mortgage and may cause the REMIC to lose its tax-free status. An additional requirement imposed by the REMIC rules is a prohibition on the defeasance of a loan held by a REMIC prior to the second anniversary of the startup day of the REMIC, which is the first day when securities in that REMIC are issued. Accordingly, standard defeasance provisions incorporated into loan documents will include a prohibition on defeasance or a defeasance lock-out period during this two-year prohibited period. What Types of Securities Can Be Used? The REMIC rules require that defeasance collateral consist of government securities as defined in the Investment Company Act. These are defined as any securities issued or guaranteed as to principal or interest by the United States, or by a person controlled or supervised by and acting as an instrumentality of the Government of the United States pursuant to the authority granted by the Congress of the United States. 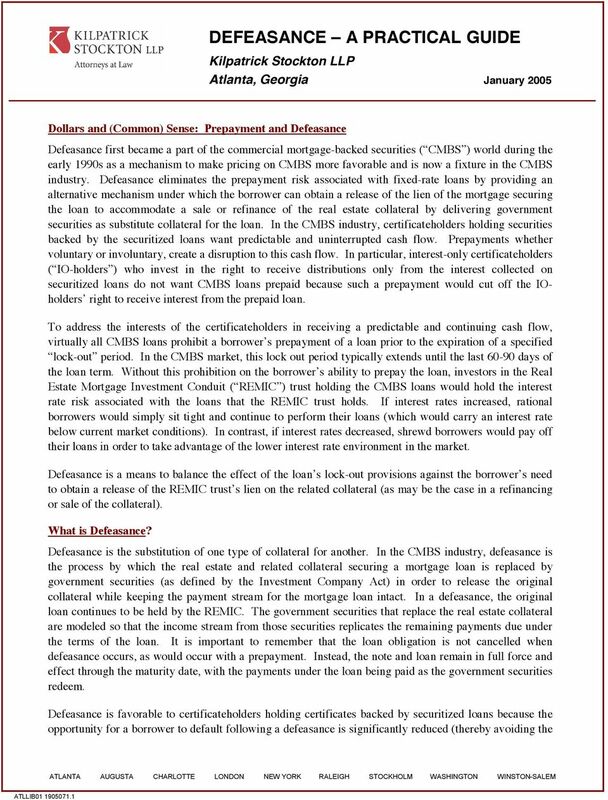 U.S. Treasury obligations, Fannie Mae obligations, and Freddie Mac obligations are included within the scope of defeasance collateral permitted by the REMIC rules. The loan document provisions relating to defeasance may require a specific type of government security that must be delivered as defeasance collateral and often specify the use of U.S. Treasury obligations. If loan document provisions require U.S. Treasury obligations to be delivered as defeasance collateral, most servicers will not allow a modification of those provisions to allow agency paper such as Fannie Mae or Freddie Mac obligations because of the perceived higher creditworthiness of U.S. Treasury obligations. The loan documents will also require that the government securities be non-callable and non-prepayable to assure predictable cash flow. How is Defeasance Accomplished? In general terms, the borrower acquires and pledges government securities in amounts and having maturities designed to mimic the payment stream required under the terms of the mortgage loan. 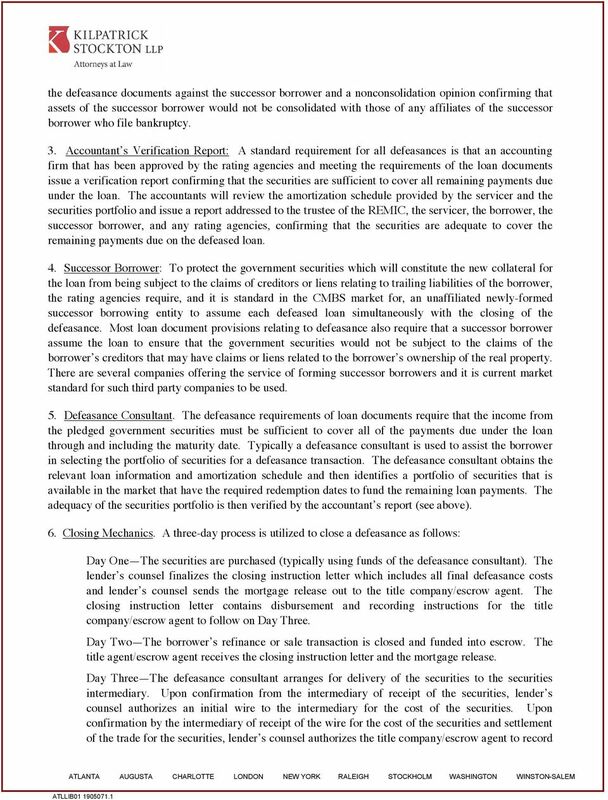 This substitute defeasance collateral is then transferred to, and the loan is then assumed by, an unaffiliated special purpose entity which becomes the new borrower on the defeased loan (the Successor Borrower ). 1. 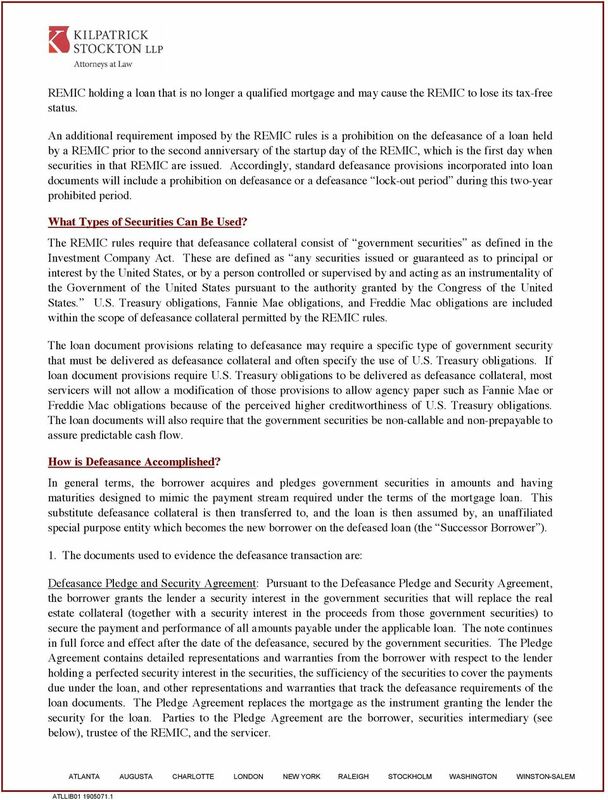 The documents used to evidence the defeasance transaction are: Defeasance Pledge and Security Agreement: Pursuant to the Defeasance Pledge and Security Agreement, the borrower grants the lender a security interest in the government securities that will replace the real estate collateral (together with a security interest in the proceeds from those government securities) to secure the payment and performance of all amounts payable under the applicable loan. The note continues in full force and effect after the date of the defeasance, secured by the government securities. 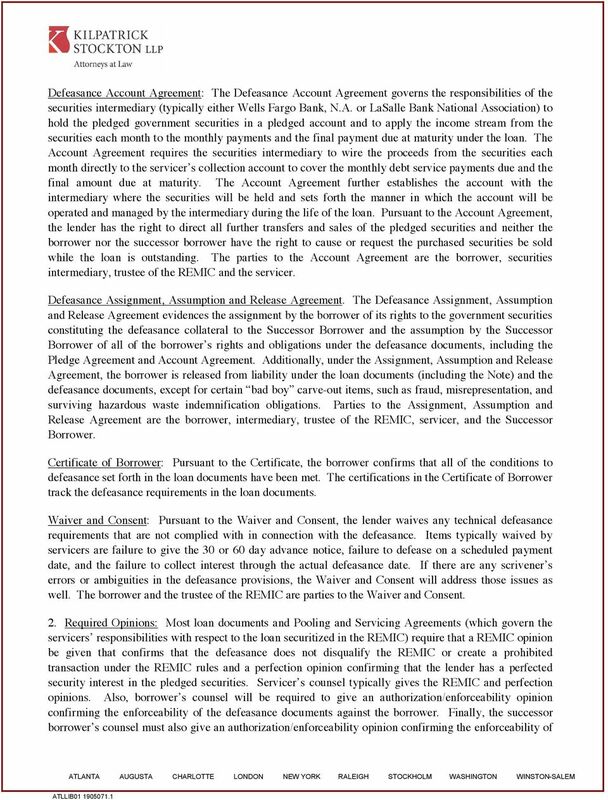 The Pledge Agreement contains detailed representations and warranties from the borrower with respect to the lender holding a perfected security interest in the securities, the sufficiency of the securities to cover the payments due under the loan, and other representations and warranties that track the defeasance requirements of the loan documents. The Pledge Agreement replaces the mortgage as the instrument granting the lender the security for the loan. Parties to the Pledge Agreement are the borrower, securities intermediary (see below), trustee of the REMIC, and the servicer. Recourse vs. Nonrecourse: Commercial Real Estate Financing Which One is Right for You? Early Summary of Ability to Repay and Qualified Mortgage Rules under Dodd-Frank Wall Street Reform and Consumer Protection Act. 1. 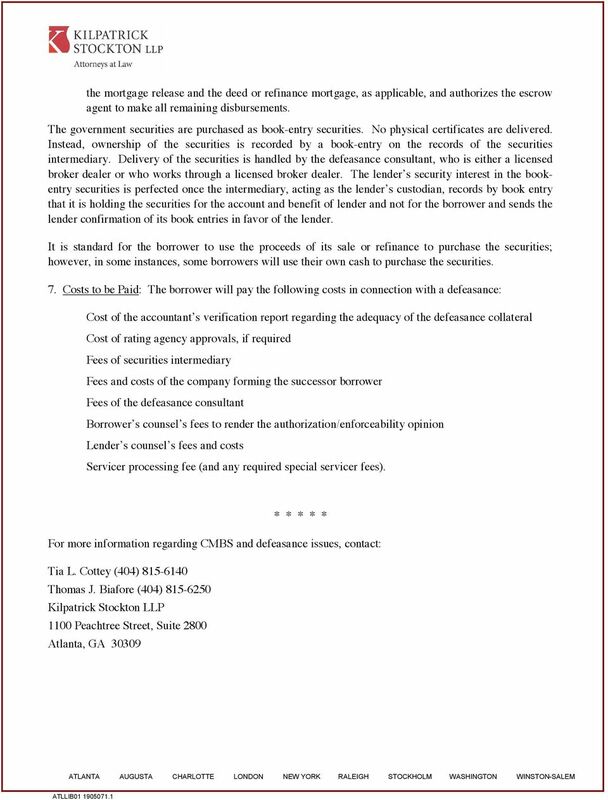 Under an installment contract, the title to the property is held by the A) vendor. B) vendee. C) trustor. D) trustee. Name: Date: 1. Under an installment contract, the title to the property is held by the A) vendor. B) vendee. C) trustor. D) trustee. 2. Charging more interest than is legally allowed is known as A) escheat. Mortgage Terms. Accrued interest Interest that is earned but not paid, adding to the amount owed. Mortgage Terms Accrued interest Interest that is earned but not paid, adding to the amount owed. Negative amortization A rise in the loan balance when the mortgage payment is less than the interest due. Customer Fee: A combination of the appraisal fee and the credit report fee represents the application fee. Customary Fee: The actual fee charged. Tip Sheet. Keep in mind we are not a law firm and this is not legal advice. All advertising should be reviewed by an attorney prior to distribution.